Can our maths help Stratford decide if 3 new concrete factories are too dirty? Jeremy Judge and I have just reached the end of our project exploring the inquiry question ‘can our maths help Stratford decide if 3 new concrete factories are too dirty?’ The answer, it transpires is yes, yes it can! 14 weeks of risky, challenging and exciting exploration later, with multiple dead-ends, some serious writing graft and one powerful algebraic model, and the big news is that the LLDC have asked the concrete company to withdraw their application! The Evening Standard letter that sparked the whole project. This project was, as written about in my first blog, in part, an experiment in truly authentic learning. We took a real world problem that was yet to be solved (hitting the top of our self-styled authenticity hierarchy) and set about solving it live, in real time with our students, together as one 16-strong team. and that true purpose can kill a checklist of project ingredients. If you want to see our full project reflection, feel free to have a read here. 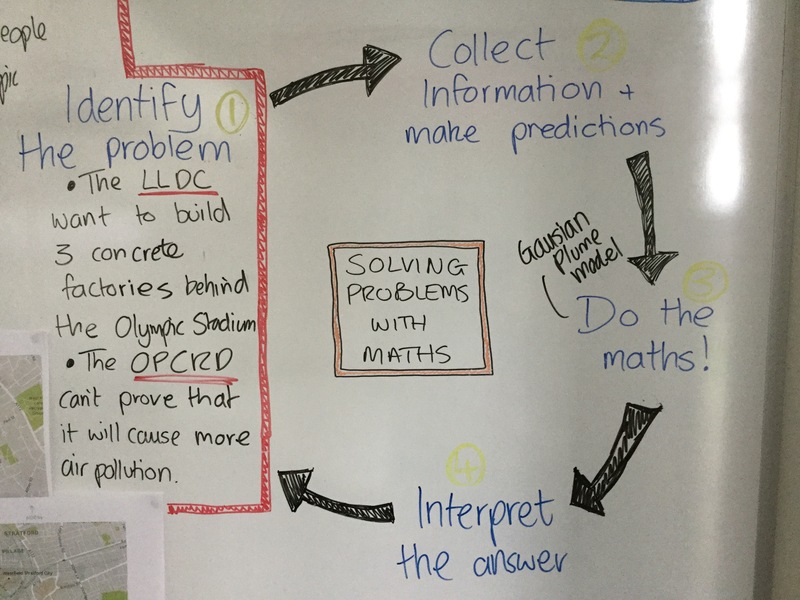 The whole process, start to finish went through what School21 colleague Mark Blundell calls the ‘double diamond’, a 4 stage of process that goes through two rounds of divergent and convergent thinking as it moves from initial ideas to delivery. Mark Blundell’s ‘Double Diamond’ of PBL planning. The equal weighting of these sections on this diagram is somewhat misleading; they are certainly not equally chunked sections of the planning process, or indeed necessarily linear. For me, the ‘discover’ and ‘define’ elements are a constant ongoing exploration (I literally bank ideas, products, opportunities etc and then wait for the perfect storm of learning, authenticity and purpose) and for Jeremy and I with this project, this was around 3 months of patient waiting and spirited arguing. Once we defined our idea, the sudden flurry of action kicked off with the ‘develop’ phase in the half term leading up to the project launch. It was here that we focused around the project design and put in the serious planning. Here you can see the outcome of this stage, the planning overview behind our project – this original plan was tuned by a group of school staff initially and then by the class themselves before the project began. To get to this though, it was certainly worth the slow, lengthy ‘fishing’ process of the first 2 sections – the sort of ‘waiting by the pond’ for the perfect bite. Our timeline document gives the very false impression that this project was clearly structured from the off. It was in truth a constantly changing beast with shifting goalposts beyond our control, constant dead-ends and false starts, and the document as it stands was created very much by the day. In fact, this project’s authenticity meant a required flexibility of timeline and direction of learning that I haven’t dealt with before (as I blogged about in December). Despite the unknowns, Jeremy and I wanted real rigour of significant content and assessment, and had to very much hold each other to account throughout for our subject ‘non-negotiables’ that we had pre-identified. The changing nature of the planning process, client vs teacher rub and open problem threw numerous challenges against this and at times we were pulled or tempted away from our desired line of learning. However, we assessed each challenge under our clear design principle of being true to our subject content; if it didn’t develop non-fiction writing, algebraic skills or graph interpretation, we (mostly) didn’t do it. Rigorous development of voice and purpose in non-fiction writing and sentence control through mastery exercises (as written about in my most recent blog) and the use of shared writing as a norm. Constant building of the skills required to comprehend challenging non-fiction. For this we used a range of newspaper articles on the project and the project’s grounding text, picked for it for its value as a model and for significant content and as a style/tone guide. Growth of tier 2 vocabulary via weekly robust vocabulary sessions to benefit students for this project and beyond. The other thing that helped with our control amidst the uncertainty was ensuring absolute clarity of role; we were purely the report generators, exploring the facts, analysing the data and interpreting and explaining it clearly. It also helped that we were working as a parts of a much wider edifice of people, each with a specific and genuine role in the project. For example, James Durrant of the OPCRD was our client spokesperson, Terry Paul our voice in the local council, Elsa Aristodemou our mathematician providing advanced models, Emilia Papadopoulos the BBC presenter reporting on our work; all of these people were not brought in inauthentically to help out, but were carrying out their actual jobs and roles around us, meaning we could be entirely, authentically, air pollution impact report writers. This importance of clarity of role is something that I think we must take forward into future projects. One of the things Jeremy and I have done throughout this project to ensure support, accountability and growth is to team teach/observe and feedback on one lesson a week each – so every other Wednesday Jeremy joined an English session and each other Thursday I joined his maths class. This began as observations, with feedback on our chosen students or craft area given in our weekly meeting, but over time morphed into team teaching, which brilliantly blurred the lines between our content. We reflected the other week on how we had maintained this routine throughout the project with (genuinely!) no sense of loss of time or feeling we had other things to do – in reality it means the removal of between 2 and 3 free periods a week each. I think this is due to our genuine investment in each other’s practice and growth. It really matters to Jeremy that my practice around robust vocabulary teaching for example is improving as we need students to thoroughly understand mathematical words like ‘assume’ or ‘vary’, and it seriously matters to me that Jeremy is thinking about the most effective ways to use talk in his lessons to ensure students are adept at verbalising what their graphs show. Interestingly, aside of the obvious advantages of team teaching, with feedback and learning through osmosis, there are also a powerful side benefit in being forced into the discomfort of teaching another subject. It was in attempting to teach maths that I suddenly found myself completely out of my comfort zone with my pedagogy. I think (though I am as yet unable to clearly articulate the what and why of this thought…) that there is something in this for our teaching. I suddenly couldn’t rely on my subject knowledge to be able to teach something and instead had to wrestle more deeply with the why behind students’ misunderstandings or confusion. I started noticing links between missing skills or misunderstandings in student’s conceptual understanding and really thinking about the barriers and blocks that stood in the way of progress. We drafted the findings section of the report many times, using paired talk and writing to support the process. Students found describing their graphs in simple, clear and formal terms a challenge – this became the focus of much of our English work. Some of the maths we did stemmed from challenges students made of the LLDC’s original air pollution report, our grounding text. Of course, it is not the final product in a project that provides any form of useful assessment; in this case, it’s a group created outcome, which has gone through 5 drafts and is not (and should not be) reflective of all the learning or all the assessable skills/content. I see it instead as a narrow slice of the learning, useful to the world as it’s genuine purpose intended, but useful to us purely as a teaching tool (much of the writing learning for example, came through critique and redraft of this document). Instead, we assessed with a triangulated combination of ongoing class assessment, cold assessment of reading and writing at the end of the term and verbal viva style ‘story of learning’ assessments. This leaves us with a combination of narrative assessment comments and hard data, and a forensic understanding of their learning. These verbal assessments are my favourite part of each project – a 10 minute one-on-one conversation which reveals so much truth behind each student’s feeling and progress, which data alone cannot reveal. In the past these have uncovered shaky understanding where the data implied solid growth, unexpected misconceptions, and sometimes progress that has gone unnoticed elsewhere. As we hone this practice, I think we now need to decide a) when is the ideal time to have these assessments so that we can identify and respond to gaps early b) what are the right questions to ask in this viva assessments to inform future practice and c) how do we ensure this knowledge is fully used for future planning/future teachers of the group. Fascinatingly, the huge real world success of our project also led to the death of certain elements of ‘gold standard’ PBL, most notably exhibition. I haven’t yet decided if this matters or not. Our intended ‘exhibition’ was the presentation of the report at the LLDC’s planning committee meeting, however, this was swiftly cancelled when the students’ TV appearance and power of the public campaign led the LLDC to withdraw the plans before the meeting. The abrupt end of the project left us with an interesting uncertainty; do we plough on and provide some form of exhibition for the students or end it there? We sort of chose both and neither, leaving an odd sense of loss for all involved! But its interesting to step back and notice the complete loss of purpose for both staff and students once the true purpose had been achieved – perhaps we didn’t need the exhibition because we didn’t need the motivation. The question that I feel remains is without public exhibition, how do we achieve the student accountability and testimony that this provides, and does this matter? Certainly something to consider. Students grappling with some tricky maths in an English lesson. Posted on February 11, 2017 February 23, 2017 Categories Authentic Learning, Concrete Project, Education, English TeachingLeave a comment on Can our maths help Stratford decide if 3 new concrete factories are too dirty? In my previous blog post I referenced the weekly ‘grammar gym’ mastery sessions that I have been doing with my concrete project group in year 9. This developed out of watching primary teachers in my old school teaching sentence forms and then practicing them repeatedly. It was something I stole at the time and used with a year 11 group as practice, and have been playing with strategies of grammar mastery since then. When I first taught the concrete project group in year 7, I began to use this strategy to teach the group some of the sentence structures and connectives that were missing from their toolkit of language at that time. It’s not something I’ve needed to do so explicitly before as a secondary teacher. Yes, I’ve reviewed grammar rules, and taught the use of more complex sentence structures, but I’d never previously had to explicitly teach students to use more than simple unconnected sentences, and the very basics of connectives/constructing a sentence. As time has gone on with this group, the skills we learn and repeat in the grammar gym (always within context of the project we are working on) have become increasingly sophisticated. It’s been really interesting watching the impact of this weekly practice and instant feedback/instruction on students individual writing and shared writing. See for example a selection of one student’s grammar gym work from across year 9 so far as he has got to grips with using who or which to add more information into a sentence. An early Grammar Gym from the term before the concrete project, when we first attempted these sentences. It’s clear that the purpose of this sentence structure is not understood at this point. A heavily supported Grammar Gym from the same student early in the concrete project. His independent attempt in this Grammar Gym displays his growing understanding of the purpose of this sentence structure and interestingly shows him punctuating accurately too. He has taken on a really complex sentence in this, a significant growth in his control of language. Completely independent from a few weeks ago! This doesn’t just show a memorising of a language form, but a conceptual growth. His competence using complete sentences, commas to control subordinate clauses and his understanding of the function of such sentence structures have grown significantly from initial heavily supported attempts to completely independent craft. And this competence is vital to the progress of these students; I’m actually not necessarily a huge fan of repeated grammar practice and drill but for these students, all of whom arrived at School 21 lacking some key skills for accurate and flexible communication and with gaps in language development, this internalising of language forms and structures is incredibly liberating and vital. However, I’d argue that the increasing levels of competence of these students relate to the want and need they have for these skills: the purpose that the authentic project has provided. They need to be able to describe their maths accurately and fluently (an early foray out into Stratford to speak to the public about the factory proposal brought the group to the realisation that “we need to be really clear about what we mean – people don’t all understand maths…”). They want the LLDC to take them seriously and understand the findings their report has exposed. They need written fluency, eloquence and control. This brings me back to the interlinked need for competence, autonomy and relatedness in the project. You can of course teach English from a competence alone stance, but when taking the importance of relatedness into account, there is suddenly a real purpose for these skills, a need for the competence to increase and a desire to graft away in order to do so.